How much does it cost to travel to Costa Rica? How much money will you need in Costa Rica? ₡16,249 ($27) is the average daily price for traveling in Costa Rica. The average price of food for one day is ₡3,950 ($6.65). The average price of a hotel for a couple is ₡17,689 ($30). Additional pricing is in the table below. These average travel prices have been collected from other travelers to help you plan your own travel budget. How expensive is Costa Rica? How much money do I need for Costa Rica? Costa Rica is one of the world's best ecotourism destinations. The country is famous for it's national parks which are as diverse as the country itself. Don't miss seeing an active volcano at Arenal or the beautiful green crater lake at Poas. 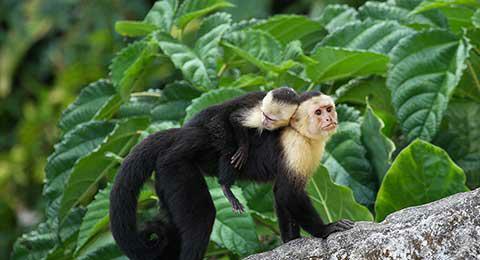 Relax on the beach with monkeys at Manual Antonio and enjoy the Caribbean vibe in Cahuita. This is not a country you visit to experience city life. Most people fly into San Jose and then head out the next day. Costa Rica is all about wildlife, natural landscapes and the "pura vida." It's the place to come to experience a cloud forest or see hatching sea turtles. It's a place where you can see the tourism industry actively partnering with conservation groups to find a common interest in preserving the environment. Ecology is important throughout this country and it's truly a success story of what can be done to benefit both the economy and the environment in a resource rich country. Costa Rica has been discovered by travelers from around the world, but that doesn't mean there aren't places left to be explored. Cheap flights into San Jose make the country a popular destination for Americans and Canadians alike. If you rent a car you'll have access to many places that most travelers don't reach. The popularity of Costa Rica also means that there are plenty of amenities for tourists in the form of cheap hotels, restaurants, and tour packages. There are also tourist buses that make the routes faster than the local buses, if you find yourself short on time. Because of it's small size and easy accessibility, it's possible to see a lot of the country in a short amount of time. Do consider your options though, as Costa Rica should be more than just a highlights tour. Many people who visit this country make a point of spending time at both the beach and in the forest. There are many different beaches to choose from on both the Pacific and the Caribbean sides. To see the cloud forest, the most popular destination is to head to Monteverde. This is also a popular area for zip lining and adventure sports. On the coast you can enjoy any number of activities including surfing, kayaking, and deep sea fishing. While many people choose to make arrangements before they arrive in the country, it's very possible to organize everything once you arrive. This often proves to be the cheapest option as well. This country has an excellent public transportation system. Buses are the easiest way to travel around and they reach most destinations. If you're hoping to get a little more off the beaten path then a rental car may be useful, but for most destinations, the buses are the way to go. They are generally reliable and comfortable and it's easy to purchase tickets. It's a perfect option for both seasoned and first time travelers. Food in Costa Rica can get a little monotonous. Rice and beans are typically served at every meal. Meat is often well seasoned, but there are times when the flavor can be a little bland. If you're looking for the best dining experiences, head to the beach where you can enjoy fresh seafood that is prepared any number of ways. Although seafood dishes are typically a little more expensive, they are well worth it, particularly if you're a little burned out on the rice and beans. Many people head to this country for the adventure sports. There is everything available to visitors from zip lining, to whitewater rafting, or surfing. You can take lessons in any number of activities. Participating in these activities can really enhance your trip and allow you to have a little more diversity in what you see and do. Many people choose to visit either the Pacific or the Caribbean coastline. Both or very different and offer interesting experiences. If you're interested in snorkeling, then the Caribbean side has more to offer. It also has an interesting vibe that is very laid back and relaxed. For deep sea fishing or scenic beaches, the Pacific side is more appropriate. If you can fit both sides in, then definitely do, as they are very different places and offer unique perspectives on the country. Many people do a highlights tour of Costa Rica. It's easy to visit for a couple of weeks and go to the same places that everyone else does. Instead, try to find at least one off the beaten path destination and add it to your itinerary. In the end, it's likely to be your favorite stop off. Costa Rican Wildlife: Head to any of the national parks to see some wildlife. Wildlife viewing is one of the most popular activities in the country and you can expect to see anything from quetzals, to monkeys or slothes. Many people head to Costa Rica specifically for the bird watching, but the rich biodiversity of the area will quickly turn any vacationer into a wildlife guru. Poas Volcano: Just a short distance from San Jose, the crater lake in this volcano is a stunning emerald color. Many people choose to visit the volcano as a day trip from the city, but if you decide to stay the night you'll have the place to yourself in the early morning. Morning hours are also when you're most likely to catch a glimpse of the emerald water as cloud and fog often rolls in during the afternoon. Arenal Volcano: Pictured on many Costa Rican postcards, you can only hope that you're lucky enough to see the volcano actively erupting. Even if you don't catch a glimpse of the lava flowing, the area around Arenal is a great place to visit. It has hot springs that are a favorite of many visitors to the country. Most people don't travel to Costa Rica for the food. It's very simple, but natural in flavor. Most dishes are made with rice and beans which are served with a meat option and a salad. On the coast you can enjoy any number of delicious seafood options, and fresh fruit is available throughout the country. The dishes are usually mild in flavor, but slow cooked to ensure that the herbs are well blended together. Gallo pinto: This is one of the more popular rice and beans dishes. It is usually seasoned with cilantro and onion and it's most commonly served as a breakfast dish. It's a filling way to start out the day and you will find it on most restaurant menus throughout the country. Casado: This is a popular lunch dish that usually combines rice, beans, and a meat such as chicken or fish. It is usually accompanied by a salad and fried plantain. It's a filling dish that is mild in flavor but, when seasoned correctly, can be very delicious. It is also widely available throughout the country. Salsa Lizano: This is a condiment option that is available on most tables in restaurants throughout the country. It's really the Costa Rican answer to ketchup and is used to flavor almost every type of Costa Rican food. Try it once and you'll likely be hooked. It is not spicy, but does have strong flavor. There are plenty of local transportation options in Costa Rica but a comfortable and affordable option is Tica Bus. It runs throughout Central America and is very reliable. Don't shy away from other transportation options, but know you can travel reliably with Tica Bus.